Allegro Poppy is an Oriental Poppy and will provide a cheerful display of huge, deep orange-scarlet petaled flowers in late spring to early summer. The centers of each poppy are black and makes for a striking display. The plant forms a low clump of deep green, coarse, hairy leaves, and will go dormant after flowering and will completely disappear by late summer. Plant Allegro Poppy with other plantings that will cover up their spot in the garden as they disappear. This Poppy will grow to a height of 18" to 24" tall and just as wide. Plant Allegro Poppy in full sun in well drained soil. 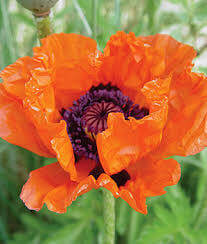 Poppies will also tolerate wet soil so you can plant these next to a pond or stream or in a boggy area. When in bloom, they will attract butterflies and bees and they make a great cut flower. Deer tend to stay away from poppies and they will work well in containers. Allegro Poppy is also a Firewise plant.